At the risk of being a sell-out, I set up this website to talk about my thoughts and feelings. I've been thinking a lot lately and wanted a place to put my thoughts down. So, I hope this blog somehow gives some insight into my mind. So, what's the significance of the name of this site? Who is the revolutionary nazarene? Well, we'd be remiss not to note that Jesus was the original revolutionary nazarene. I've started to think about that more and more often, and in my desire to be more and more like Jesus, I've taken up the mantra of a revolutionary nazarene. I got this idea from a guy I used to know named Chris Bean to read 52 books in one year. 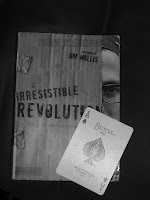 I started in the first week of April with a book I had been meaning to read for a while, The Irresistible Revolution by Shane Claiborne. This is a great book, and a must read for anyone who has the desire to be a follower of Jesus. I'm posting a brief excerpt, it gives me hope that Christians can honestly do the right thing. That's something I really needed to hear, and it speaks to me on a personal level because I don't have health insurance and I worry about living in our society without it. We need the imagination to dream what this sort of radical interdependence could look like. In our community, one question we continually revisit is health insurance. Many of us feel uneasy living without it, especially as we have kids entering our communal life. And yet it is difficult to use that privilege when many of our neighbors go withut health care. It conflicts my spirit to take assistance from the government when I believe it is the primary responsibility of the new community to care for one another. A few years ago, I came across a collective of thousands of Christians who pool their money each month in order to cover one another’s medical bills. This feels much more in harmony with the spirit of the early church, the sense of being a big family with a parent with a big wallet. So I am now a part of that community, and each month I get a letter telling me who’s in the hospital, where my money is going, and how to pray for my sisters and brothers. Over and over, I have seen the divine multiplication meeting peoples needs. And a few years back, I had an accident and racked up a $10,000 medical bill. I brought that need before the community and it was met in full." If you haven't read this book, go and get it. It's phenomenal.